Equitorial Exploration (TSXV:EXX, FRA:EE1, OTCQB:EQTXF) is a Canadian mineral exploration company focused on developing its diverse portfolio of wholly-owned lithium projects in North America. The company’s flagship property is the Little Nahanni Pegmatite Group (LNPG) project in the Northwest Territories which hosts lithium-cesium-tantalum type mineralization common to today’s large, high-grade hard rock mines. 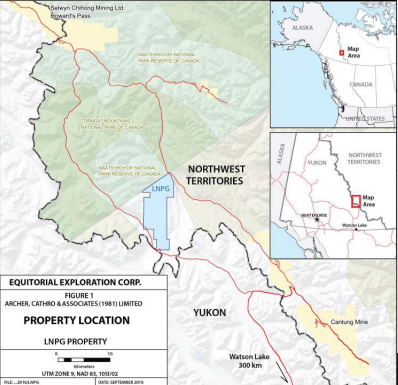 Equitorial Exploration’s portfolio also contains three other highly prospective projects, Cat Lake in Manitoba, Tule Valley in Utah and Gerlach in Nevada. Sampling at the LNPG project has returned grades in the range of 2 percent to 3 percent lithium oxide, which is much higher than the industry average of 1 percent to 1.5 percent. Its proximity to infrastructure, including the processing facility at the Cantung Mine now owned by the Northwest Territories Government, leads management to believe LNPG has the potential to be a near-term producer for the lithium market. Equitorial Exploration’s is advancing the project, having recently completed a drill program aimed at testing depth, proving grade and tonnage, and better positioning the project for government consideration in regards to using the Cantung flotation plant for mine sampling or production. Results from the drill program indicated values such as 1.47 percent Li2O, 39 g/t Ta2O5 and 0.03 percent SnO2 over 9.66 meters. In November 2017, Equitorial acquired the Cat Lake project in Manitoba, Canada. Having seen past exploration work in the 1950s, the property has a historical resource estimate of mineral resource of 1.25 million tons of ore at 1.51 percent Li2O. In early 2018, Equitorial conducted its first drill program on the property with the goal of outlining the pegmatites on the property. Positive recent sampling results at the Tule Valley lithium brine project led to Equitorial Exploration’s staking additional claims, giving it control of nearly the entire basin. Management is planning a major sampling and large ground geophysical program. The company is in discussions with different facilities to conclude agreements to test new technologies focused on more timely and efficient processing of lithium brines for commercial-scale lithium production. Four wholly-owned hard rock and brine lithium properties with excellent potential in strategic locations. By completing this form, you are giving consent to receive communication from Equitorial Exploration using the contact information you provide. And remember you can unsubscribe at any time. 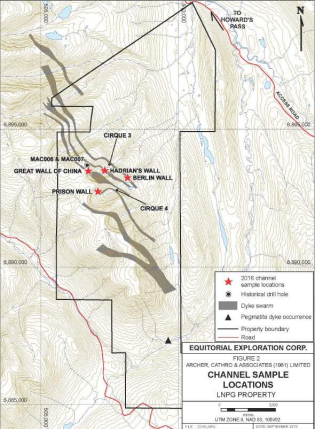 The Little Nahanni Pegmatite Group lithium property hosts lithium-cesium-tantalum (LCT) pegmatite-type mineralization in a system of dike swarms that extend over 13 kilometers of exposed strike length and up to 500 meters wide. The geology of the LNPG property is similar to the Greenbushes lithium mine in Australia. The 5,393-hectare property is accessible year-round and located in a well-known mining district. It is 5 kilometers from the access road to the large Howard’s Pass zinc-lead project, 30 kilometers northwest of the Cantung mine and immediately east of the Yukon border. The Northwest Territories Government purchased the Cantung processing facility which includes a flotation plant, and is considering agreements with local mining companies for its use. Originally a target for tantalum exploration, LNPG has been the site of sporadic exploration since 1979 with minimal lithium exploration. Historical exploration on the property includes channel sampling (up to 1.59 percent across 10 meters), drilling (1.2-percent over 11 meters) and rock samples (1.74 percent Li2O to 3.77 percent Li2O). 0.84 percent Li2O, 38 g/t Ta2O5and 0.02 percent SnO2 over 3.68 meters. These showed significant improvements in Li2O content. Equitorial’s Cat Lake property is a 99-hectare property that covers three mining claims in Manitorba, Canada. The project sits 150 kilometers north of Winnipeg and was acquired by Equitorial in November 2017. The property also sits adjacent to the highly-prospective Cat Lake Mineral lithium project, accessible via the Manitoba highway 314. The Cat Lake property saw exploration work in the 1950s, including 25 drill holes conducted by the Lithium Corporation of Canada Ltd., which outlined a historical resource estimate of 1.2 million tons grading 1.51 percent Li2O over 365 meters in length and 213 meters at depth. In early 2018, Equitorial conducted a drill program on the property. This included the drilling of seven holes across 1,256 meters. Of these, six holes tested positive for pegmatite potential and the results also indicated spodumene-bearing pegmatite of approximately 33 meters in width. The pegmatite system remains open horizontally and vertically. The Tule Valley lithium brine project has similar geology to Nevada’s Clayton Valley in that both are closed basin playas which hosts active evaporation pools and are located in an arid climate. The 6,900-acre property is located 190 kilometers southwest of Salt Lake City within an area known to host several lithium-bearing hard rock properties which may have contributed lithium to the region’s groundwater. 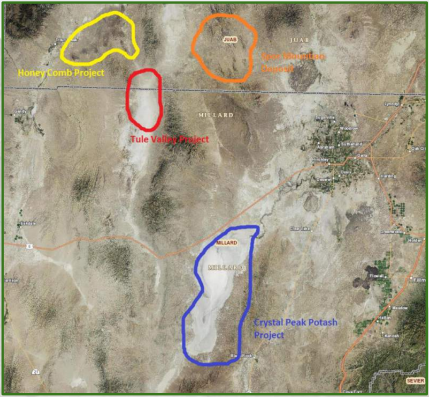 Other mineral properties in the area the Crystal Peak Mineral’s potash-lithium-magnesium brine project (60 kilometers southeast) which is in an evaporate basin similar to Tule Valley and has NI 43-101 compliant reported lithium values in solution ranging from 50 to 200 mg/L. Twenty kilometers to the north of Tule Valley is the Redhill Resources’ Honey Comb beryllium-rubidium-lithium-rare earth project which has NI 43-101 compliant reported surface sampling assays of 1,500 ppm to 1,700 ppm lithium. Water and soil sampling conducted in August 2016 resulted in highly saturated samples as high as 200 ppm lithium, suggesting the deposition of near-surface lithium mineralization. Equitorial Exploration conducted a ground geophysics survey at Tule in April 2017. The results demonstrate the valley fill has a depth of over 500 meters in the western portion of the property and deepens further heading east from the claim blocks. The promising results prompted the company to pick up an additional 135 claims covering 2,700 acres. 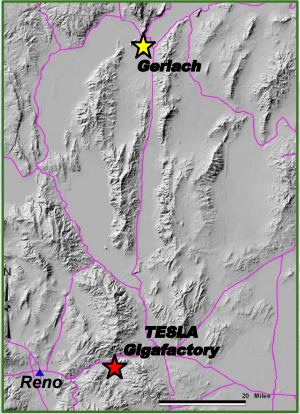 The Gerlach lithium brine project is located in Washoe County in mine-friendly Nevada about 120 kilometers north of Tesla’s Gigafactory #1. The property covers 1,780 acres within Nevada’s San Emidio playa—the southern lobe of the Black Rock Desert which is the largest dry lake bed in the continent and known for its natural hot springs. The U.S. Geothermal Co. operates a geothermal electrogeneration plant about 27 kilometers to the south of the project, confirming the presence of brine-associated geothermal activity in the playa. Gerlach shares similar characteristics with Clayton Valley; both are closed basins with geothermal activity. Buddy Doyle worked with Rio Tinto for over 23 years and most recently as Exploration Manager/Vice President of Kennecott Canada Exploration Inc. (owned by Rio Tinto), in charge of North American diamond exploration. He was a key member of the Kennecott Exploration Australia team that discovered the multi-million ounce Minifie gold deposits at Lihir in 1987-1988 and led the team that discovered the Diavik diamond deposits in 1994-1995. Few geologists have seen two projects from discovery through decision to mine. Doyle is recognized by his peers as an authority on diamond exploration and kimberlite geology, and has authored/co-authored numerous papers on these subjects. He was awarded the 2007 Hugo Dummitt Award for excellence in diamond exploration. Buddy Doyle brings to Equitorial a scientific approach to mineral exploration and managerial skills with a proven track record. Binny Jassal brings over 20 years of accounting and management experience to the company. Jassal is a member of Certified General Accountants in Canada, fellow member of the Association of Chartered Certified Accountants in London, England and holds a Certificate of Accounting Finance for Ryerson University, Toronto. Binny Jassal has worked in various positions – with public and private companies – in the manufacturing, IT and telecommunications sectors. Jassal joined Equitorial in 2006 and has been an important member of the team working on the financial and corporate aspects of operations. Saf Dhillon served as Head of Investor Relations at U.S. Geothermal Inc. Dhillon has worked in the Banking, Investment and Securities industries for the last 20 years in both the Public and the Private Markets. Dhillon had been involved in raising over $75 million for the venture capital markets. He has been involved in the growth, development and corporate communications of U.S. Geothermal Inc. He has been a Director of Equitorial Exploration Corp. since December, 2015. From 2007 to 2010, Robert Bick served as CEO and Executive Chairman of Evolving Gold Corp. During Robert’s tenure, Evolving Gold raised over $50 million, moved from the Canadian Securities Exchange to the TSX main board. EVG’s market cap increased from $3 million to over $100 million. Robert Bick was the founding CEO of Prima Diamond now trading as Voltaic Minerals (TSX-V:VLT) and has served as CEO and Director with several other junior resource companies. He is the founder of Resource Clips http://resourceclips.com/ providing news to the resource sector. Bick brings to Equitorial a comprehensive understanding of the requirements of building junior resource public companies. *Disclaimer: The profile provides information which was sourced and approved by Equitorial Exploration in order to help investors learn more about the company. Equitorial Exploration is a client of the Investing News Network (INN). The company’s campaign fees pay for INN to create and update this profile page, to which links are placed on Investingnews.com and channel newsletters.